After carefully reviewing this website, a community can explore permanent installation of a Voyage exhibition by having a preliminary phone conversation with the Voyage National Program Director, Dr. Jeff Goldstein. You can schedule a conversation with Jeff by emailing him at: jeffgoldstein@ncesse.org. The conversation will allow us to assess if the community understands the nature of the exhibition, and the requirements for site, cost, and installation. A community that is deemed a good fit for this program can then more formally explore installation of an exhibition via the 6-Step ‘Onboarding Process’ that is covered on this webpage. This process includes: 1) assessing if there is a viable local site for a 1 to 10-billion scale model Solar System; 2) submitting an Implementation Plan for review and approval; 3) determining total expected cost, and submitting a Community Program Budget for approval; and 4) conducting a formal Site Survey and submitting a Letter of Site Authorization. Once these 4 steps are completed the community can (5) purchase a Voyage exhibition via Contract, and (6) address exhibition shipping and installation requirements. Each of the 6 steps described in more detail below is associated with a password-protected page. All pages have the same password, and entering the password on any page should automatically grant you access to the other pages. A preliminary conversation with the Voyage National Program Director is required before password access to the pages below will be granted. The Voyage exhibition is a 1 to 10-billion scale model of the Solar System, requiring a reasonably linear 2,000 ft (600 m) walking path. The scale of the exhibition cannot be changed to suit a specific site. There are specific pedagogical objectives for the visitor experience that dictate why the 1 to 10-billion scale is adopted, and all exhibition storyboards, and supplemental Voyage education materials (the Grade K-12 Curriculum and Tour Brochure), are designed to this scale. Often a community interested in installing a model of the Solar System has a scale in mind that may not derive from a careful look at maximizing the learning experience for the visitor. Often a scale results from a creative marketing approach – a long drive from well known point A to well known Point B, or the Sun the size of an existing spherical structure. But an exhibition first and foremost should be focused on the educational experience for the visitor – the learning objectives. We invite you to read the Voyage’s 1 to 10-Billion Scale page for a deep dive into why the 1 to 10-billion scale is so important from the standpoint of maximizing the visitor experience. To determine if there is a viable local site for the exhibition, we ask your community to provide a possible location for the Sun. We will then superimpose the location of the Sun and the orbits of the eight planets (Mercury, Venus, Earth, Mars, Jupiter, Saturn, Uranus, and Neptune), the dwarf planet Pluto, and the Asteroid Belt, on Google Earth images of your community. 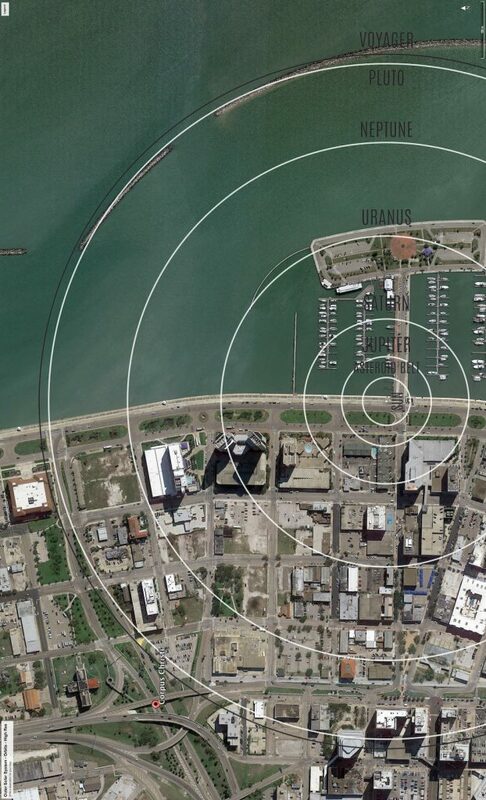 The resulting maps will allow you to see if the orbits intersect an appropriate walking path. The idea is that the 13 exhibition stanchions would be installed at the intersections of the orbits and the walking path. Working with you, we can also try multiple locations for the Sun, and help you assess site options. As an example, see the image above for the outer Solar System in Corpus Christi, TX. The walking path is along the sea wall. Finally, an Informal Site Visit by your team allows you to assess if there are any unexpected and obvious issues with the proposed site. A community interested in installing Voyage is typically reflective of a consortium of local stakeholder organizations, with one designated as the lead. The lead organization could be a school district, a museum or science center, a university, a community-based non-profit, or a local government. The submission of an Implementation Plan by the community’s lead institution, working in concert with the other stakeholders, is required. The Plan demonstrates how the exhibition and educational materials will be put to work to address the Voyage Key Objectives, hopefully in perpetuity. We are looking for communities that do not just install the exhibition as a passive experience, but through collaboration with other local area stakeholders, will put Voyage to work through, e.g., guided tours, self-guided tours, and classroom-based pre- and post- visit lessons on Solar System science and exploration. We recognize that individual stakeholder organizations have unique strategic objectives, and an array of educational, marketing, and business assets tailored to their strategic objectives. We invite a community to make use of these assets in their Implementation Plan, which means that each community will likely submit a plan that reflects the uniqueness of their community. More generally, Voyage is a program of the National Center for Earth and Space Science Education (NCESSE), and we embrace a Learning Community Model for STEM education, which should be reflected in the Implementation Plan. the cost of crating the exhibition is already included in the cost of the exhibition. the community is responsible for securing a vendor for installation of the exhibition. This in fact may require little to no added cost if a facilities maintenance department of one of the stakeholder organizations takes this on as part of their operational costs. Additional possible annual operating expenses borne by the community include: regularly scheduled cleaning and inspection of the exhibition (we recommend cleaning be done at least once every two weeks); insurance; and the cost of all programming conducted regularly by local stakeholder organizations – programming which is fully detailed in your Implementation Plan. All these costs need to be part of your community’s budgeting considerations, which should result in a budget that details two phases: i) purchase, installation, and opening events, and ii) annual operating expenses. Your community will then need to assess what funding sources are available to support both phases, and the timeline for securing those funds. All this information is formally submitted to the Voyage National Program as the Community Program Budget for review. As is the case for the Student Spaceflight Experiments Program (SSEP), the National Center for Earth and Space Science Education will consider providing fundraising assistance for a community that demonstrates need. We are good at it, and as a non-profit our motivation is clear – to promote meaningful and sustainable STEM education experiences at the local level (see our Core Beliefs). We will consider a community’s request for fundraising assistance, but only for the baseline cost – the contractual cost. A request will be assessed on a case-by-case basis, and take into account the proposed program scope detailed in the Implementation Plan and how it addresses Voyage’s Key Objectives; the community’s level of funding commitment for annual operating expenses; and the availability of the Center’s staff resources for fundraising. Once a community’s Implementation Plan and Community Program Budget are approved, and the community has decided to proceed with the purchase of a Voyage exhibition, the next step is for your team to conduct a Site Survey – to walk the proposed site in a formal way, with the goal of determining the precise locations of the stanchions relative to the model Sun, and relative to the local landscape, and to ensure all stanchion locations are free of pre-existing obstacles. A Site Survey includes staking the location of the stanchions in a semi-permanent way, recording the stanchion distances from the model Sun, and submitting these data to the Voyage National Program for review and approval, so we may ensure the accuracy of the proposed scale model Solar System on your site. At the end of the Site Survey, your community needs to submit the Voyage Stanchion Location Document, providing the precise distances of your stanchions from the Sun stanchion, and a Stanchion Location Map, which is a high resolution scale map of your proposed exhibition site with the marked locations of all 13 stanchions. The community’s lead institution may not have legal authority to install Voyage on the proposed site. A Letter of Site Authorization (we provide a template) is therefore required, which is signed by the institution with both legal authority over the site, and authority to approve permanent installation of the exhibition on the site. It may be the case that different organizations have such legal authority over different segments of the 2,000 ft walking path for Voyage, which would require a separate letter for each segment. Purchase of a Voyage exhibition is executed through a Contract that defines costs, deliverables, and roles and responsibilities. On contract signing, 50% of the total contractual cost is due, and the community is put in the queue for exhibition fabrication. The final 50% of the contractual cost is due on receipt and inspection of the exhibition at the community’s ship-to site. Note: fabrication of a Voyage Mark II exhibit requires contracts in place from at least 10 communities in order to start a production run. Your community needs to submit a Formal Site Map along with the signed contract, which provides the precise locations of the stanchions on a scale map of the exhibition site. The Formal Site Map must include local landmarks, including buildings, streets, and walkways, and serves as the formal map on file for the Voyage exhibition in your community. Your community needs to submit a Stanchion Orientation Submission Form along with the signed contract, which provides the orientation of all stanchions along the walking path, whether on the left or right side as the visitor walks from the Sun. The Formal Site Map and Stanchion Orientation Submission Form, together with the Voyage Stanchion Location Document (covered in Step 4), define the Voyage installation configuration in your community that is specifically approved and covered by your Contract. There should be no modifications to these documents once the Contract is signed and fabrication begins, or, depending on the nature of the modifications, the proposed exhibition site may need to be re-evaluated and re-approved by the Voyage National Program, and/or storyboards may need to be re-designed and re-maufacutured, requiring the community to incur significant additional design and fabrication costs. Once a Contract is signed, the National Center for Earth and Space Science Education has all information needed for fabrication of either a Voyage Mark I or Mark II exhibition. During the design and fabrication process there will be multiple milestones for community sign-off, which culminates in sign-off on receipt of the exhibition at the community’s ship-to site. The National Center for Earth and Space Science Education will work with both the community and Exhibitology, the prime fabricator, on shipping details. Installation instructions for the exhibition are found in the Installation Guide. The Maintenance Guide provides cleaning instructions and a suggested cleaning schedule.